Serving the Crane Industry Since 1957. 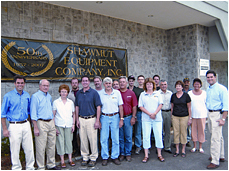 Since 1957, Shawmut Equipment has served the equipment industry as a crane dealer with an unwavering commitment to customer satisfaction. A third generation family-owned company, Shawmut represents the Manitowoc Crane Group, including Manitowoc Crawler Cranes, Grove Mobile Hydraulic Cranes, GMK All Terrain Cranes, National Boom Trucks, Potain Self Erecting Cranes, as well as carrying a variety of utility equipment. Shawmut Equipment serves customers in the six states of New England, including Connecticut, Maine, Massachusetts, New Hampshire, Rhode Island and Vermont, as well as the Atlantic provinces of Canada, including New Brunswick, Nova Scotia, Prince Edward Island, and Newfoundland. Shawmut Equipment's sales representatives have years of experience and a wealth of product knowledge, striving to bring the highest levels of product support to its customers. Shawmut does not only work to find the equipment that fits its customer’s needs, but will provide unmatched customer service from the time of rental or purchase throughout the life of the machine. Shawmut's Service Department offers the most skilled and knowledgeable factory-trained technicians in New England and the Canadian Maritimes, and Shawmut’s Parts Department has the parts in stock and expertise to get equipment owner’s the parts they need quickly. Shawmut Equipment Company, Inc. greatly appreciates the business of its loyal customers and looks forward to earning the business of future customers.